MILK NOT JAILS is a volunteer-run, grassroots campaign working to build a new urban-rural alliance in New York State. We are urban and rural people, prison justice activists, farmers, artists, formerly incarcerated people, local food enthusiasts, prison families, and more who believe that one important way to fix a dysfunctional prison system that plagues both rural and urban people and spaces is to build grassroots alliances amongst urban and rural communities. Within the Kwanzaa principles of Ujimaa and Imani, Lauren Melodia, one of the co-founders answers a few questions about Milk Not Jails. What is the history of milk farms in rural New York? Upstate New York has over 7 million acres of farmland, and tens of thousands of farmers tend this land. 80% of agricultural sales in New York are from the dairy industry alone, which has historically been the largest part of New York’s agricultural economy. Why does this matter to people who desire a better criminal justice system? New York’s criminal justice system is too big, racist, ineffective and too expensive. And, while numerous organizations in New York’s urban areas are advocating for improvements to the prison system, they are met with major obstacles in the New York State Legislature. Reforms to the Rockefeller Drug Laws, the parole system, new legal requirements on the use of solitary confinement, and the way the state distributes money to prison verses community based rehabilitation programs are all stalled in the New York State Senate, because the Republicans who control the State Senate represent huge swatches of rural land where 90% of the state’s prisons are located. These politicians fear that improvements to the criminal justice system, which will reduce the prison population, will lead to fewer prison guard jobs. And, they seem to be willing to block any changes to the prison system in order to protect those jobs. MILK NOT JAILS is a grassroots campaign that seeks to tackle this problem. Knowing that 75% of New York’s prisoners come from just seven NYC neighborhoods, but 90% of the prisons are located in rural areas upstate, MILK NOT JAILS sees the crisis faced by criminal justice activists as one of political and economic geography. The prison system is being used to facilitate an economic relationship between urban and rural areas. But we think its wrong that many parts of upstate New York are putting people in cages to serve the employment needs of those areas. These upstate communities used to be vibrant agricultural communities, and we are working to build relationships with farmers – primarily dairy farmers – who are interested in building a new urban-rural relationship, where rural people produce food and other goods that urban residents can healthfully consume. Dairy farmers in upstate New York are struggling in an era of industrialized farming, and we hope that we can build a political and economic alliance with them that allows them to stay in business and allows urban people to succeed and pushing back the prison industry’s destructive influence on urban communities. Raw milk comes straight from the cow and is the traditional way people have consumed cow’s milk for centuries. In the late 1800s, when cities like New York were growing at an exponential rate, many people in NYC had their own cows that they milked for their family’s consumption. The combination of rapidly expanding cities and little sanitation technology created a situation where people were consuming milk that was making them sick. Pasteurization became the government’s remedy, though it also presented new problems. Pasteurized milk has been cooked to kill all the bacteria in milk, making it technically safe to drink. However, this also kills the beneficial bacteria that live in milk products that make milk so nutritious. And many people have severe dairy allergies to pasteurized milk. People with dairy allergies most often are not allergic to raw dairy products. Raw milk, however, is illegal for New York dairy farmers to sell unless people purchase it right at the farm. There is a big push right now to legalize the sale of raw milk in New York State again. Small dairies that take good care of their cows can easily produce a safe, more nutritious milk product that more people can enjoy. Advancements in technology and sanitation practices have eliminated all of the prior concerns about raw dairy milk. We hear about the unfairness of American legal systems and disproportional number of African Americans and Latinos in prison, but less on the prison system’s affect on rural communities. How are traditional diary farmers influenced by large prison systems in their communities? Dairy farmers in upstate New York are not directly impacted by the prison industry. However, they need their politicians to be fighting for stronger anti-trust laws, farmland preservation, increased direct market opportunities. And from MILK NOT JAILS’s perspective, these politicians are focusing too much energy on sustaining the prison industry in rural New York, which has no growth potential and shouldn’t have growth potential. MILK NOT JAILS is working with farmers to demand that these politicians look to agriculture as the base of New York’s rural economy not the prison system. Congratulations on exceeding your fundraising goals early this year. What can we next expect from Milk Not Jails? MILK NOT JAILS is in the midst of two major initiatives right now. First, we are finalizing the project’s political demands. We know that improvement to the criminal justice system and the agricultural economy requires systemic change, so we are working with our allies in both sectors to identify legislative resolutions. We are looking to focus our policy agenda on a couple of key bills, and we are currently soliciting feedback from the public on what our political priorities should be. Please help us figure out what are the most critical changes to the criminal justice system and agricultural economy, by voting on our policy agenda here (http://milknotjails.wordpress.com/policy/). We will be finalizing the MILK NOT JAILS political demands by the end of January and we want to make sure it reflect the needs of the communities most impacted by these systems. Second, MILK NOT JAILS is currently working on building a dairy marketing and distribution business with farmers who have signed onto the MILK NOT JAILS political platform. The brand gives us a concrete way to build a political relationship with these farmers. The more milk of theirs we can sell, the more we can rely on them to stand up for criminal justice reform. We are working with farmers right now to finalize the product line, and we are seeking out markets to sell these products at. We will be selling milk, cream, cheese, butter and ice cream soon. We expect MILK NOT JAILS products to be stocked at your neighborhood Community Supported Agriculture (CSA) sites, cafes, daycares and supportive housing units in the Spring. Look out for our logo on products to know which dairy products support criminal justice reform. Interested in purchasing your dairy needs from us? Contact us at milknotjails at gmail [dot] com or (917) 719-MILK so we can keep you updated on where to buy the MILK NOT JAILS brand. Could you share your favorite recipe using dairy? Roasted Pumpkin stuffed with Fondue. It’s a great recipe for the holidays that looks great on the table and comforts like mac and cheese. Center a rack in the oven and preheat the oven to 350° F. Line a baking sheet with a silicone baking mat or parchment, or find a Dutch oven with a diameter that’s just a tiny bit larger than your pumpkin. If you bake the pumpkin in a casserole, it will keep its shape, but it might stick to the casserole, so you’ll have to serve it from the pot—which is an appealingly homey way to serve it. If you bake it on a baking sheet, you can present it freestanding, but maneuvering a heavy stuffed pumpkin with a softened shell isn’t so easy. However, since I love the way the unencumbered pumpkin looks in the center of the table, I’ve always taken my chances with the baked-on-a-sheet method, and so far, I’ve been lucky. Put the cap in place and bake the pumpkin for about 2 hours–check after 90 minutes–or until everything inside the pumpkin is bubbling and the flesh of the pumpkin is tender enough to be pierced easily with the tip of a knife. Because the pumpkin will have exuded liquid, I like to remove the cap during the last 20 minutes or so, so that the liquid can bake away and the top of the stuffing can brown a little. When the pumpkin is ready, carefully, very carefully–it’s heavy, hot, and wobbly–bring it to the table or transfer it to a platter that you’ll bring to the table. 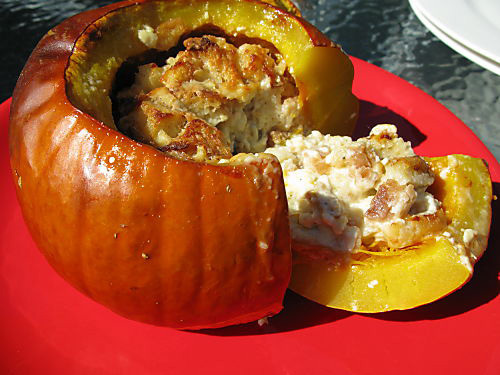 Two choices to serve: either spoon out portions of the filling, making sure to get a generous amount of pumpkin into the spoonful or dig into the pumpkin with a big spoon, pull the pumpkin meat into the filling, and then mix everything up. Visit Milk Not Jails and follow them on Facebook to learn more about their organization. To learn how to volunteer or to donate, click here. My name is Mrs. Beverly Jones I jusyt happen to be surfing the web and happen upon your site “Milk Not Jails” and I wanted to know more about it. My son is presently incarcerated in the Jamaica Queens Federal Prison and for the longest I’ve been trying to find some kind of help for my son. Right now I have a real concern with the vendors within the prison who are selling their very high priced goods to the inmates and they can’t afford to buy that stuff and his family can’t send him anything because they will take it from them. Is’nt that a violation of their rights? Purely the Advocates for prisoner’s rights are not doing enough to help alot of inmates who have noone. If it is possible could tell me who I can talked to about those greedy vendors. Also the doctors are charging a fee just to get medical attention, I know that is not right. I am looking forward to reading more about your website. Thank You. 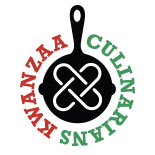 This entry was posted on December 24, 2011 by Kwanzaa Culinarians in 2011, Imani, Interview, Recipe, Ujima and tagged Imani, Lauren Melodia, Milk Not Jails, non-profit, Ujimaa.